← Social Media Replacing Research Surveys? The developer behind the #uksnow map Ben Marsh has launched a crowdsourced cuts map for Channel 4 to monitor spending cuts across the UK in time for George Osborne’s Budget. Twitter can be used to report government cuts taking place via this map. On Twitter, the hashtag #c4cuts, a place name/postcode and a link to an article will appear on the map on Channel 4’s website. So we see a big broadcaster using UGC in a fantastic way, reaching more communities than they might do otherwise. Channel 4 News say they want to “harness the power of social media and the wisdom of the crowd” to find stories they may have missed. Channel 4 News’s Head Of Online Ed Fraser told Generated By Users: “…if you ask a Channel 4 News presenter like John Snow or Krishnan Guru-Murthy a question or one of our correspondents or producers then you will usually get a reply/answer. “We are now looking to evolve the next stage of our social media strategy and reach out to the audience to help us develop our journalism both online and then to translate that onto television. There have been a lot of collaborative style projects online but few that make the translation onto television. Channel 4 isn’t the only broadcaster using innovative Budget-inspired UGC. Sky News will have a Budget calculator available shortly after the announcement so people can fill in their details and see how much better or worse they will be as a result of the Budget. The BBC also has a Budget calculator. And ITV News had a live web chat featuring a panel of experts whom users could post questions to and interact with online. @lightboxstudios: So far it seems the budget is pretty good, especially for small businesses. Nice one George, looking forward to my reduced business rates! 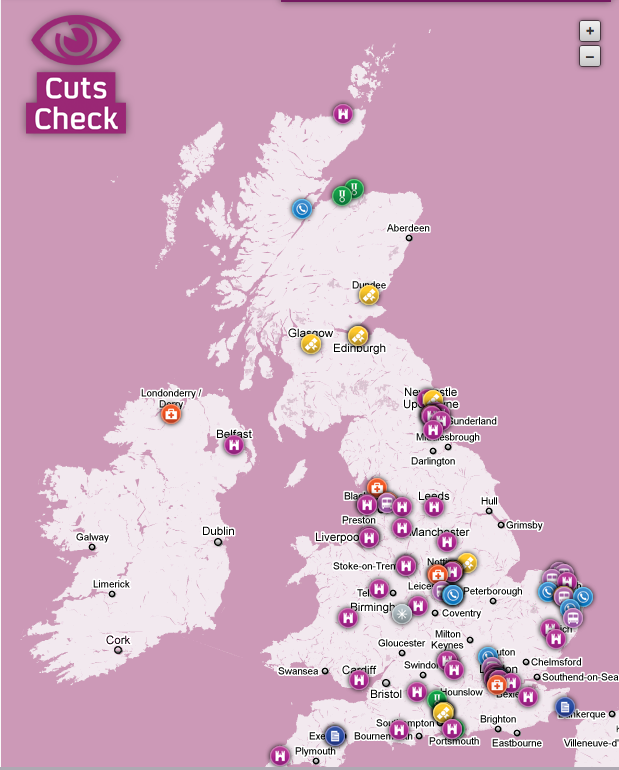 Lots of different opinions then – what are your thoughts on the cuts map/Budget? Feel free to add some UGC to this post with a comment or two! This entry was posted in Mass Media, Social Media, User Generated Content, User Generated Data Representation and tagged #c4cuts, 2011, BBC, budget, channel 4 news, cuts, George Osborne, ITV, map, March, Sky News, ugc. Bookmark the permalink.